A recent project at work has required me to implement Microsoft’s Active Directory Federation Services (ADFS) which has been an interesting change from my usual technologies. It’s a mature product (it was released with Windows 2003 and further refined in Windows 2008) designed to allow you to ‘federate’ your Active Directory – in other words to allow third parties to leverage your internal AD in a secure manner. At first I thought this project was a distraction from the skillset I’m working towards (IaaS infrastructure with vCloud Director, View etc) but I’ve since come to realize that federated identity is an essential ingredient in the cloud recipe and one which needs to be understood. Authentication – The AD acts as the identify provider (IdP), making sure the user is who they say they are. Authorisation – Once authenticated ADFS generates a ‘claim’ which it sends to the third party and this dictates what actions the user can take in the application. Of course my example is very simplistic but the principle of allowing identities to be shared securely across security boundaries (such as disparate networks and applications) is critical to cloud services. Security is one of the big challenges in the cloud and federation allows you to keep your crown jewels (your user details) secure while still consuming remote services. It’s also important as the number of mobile devices used to access services increases. The ADFS example above is just one of the many possible scenarios that federated identity must handle. In every federation scenario there is an identity provider (IdP) and a consumer or service provider (SP, sometimes referred to as a relying party). In the the example above my company are the identity provider (our AD holds the identity details) and the consumer is the third party developer who provides a service. The first choice therefore is whether you’re just going to consume other people’s federated identity services and/or act as an identity provider yourself. You’ve probably been a consumer of federated identity for a while without even realising it. Everytime you sign into a website using your Twitter or Facebook login (for example) you’re consuming the federated identity service offered by Twitter and Facebook, likewise when you post a comment on a blog which requires a WordPress login. Maybe you’ve logged into a variety of Microsoft services using your Windows Live ID? Same thing. So consuming is commonplace but why would you want to become an identity provider and federate your identity out to the world? You might be reading this article and thinking ‘I don’t offer a service to people on the internet so I’ve no need to provide identity federation’. If all your infrastructure needs are met internally that might be true. What if you want to use public or hybrid cloud? If you want your corporate users to securely use their company login to access SaaS providers like SalesForce.com or Google Apps you’ll need to become an identity provider. The purpose of the above applications varies even though they all provide identity federation. Most include SSO functionality but some are cloud based and others are installed locally (some are deployed via appliances). Some provide ‘application store’ or portal/workspace features which are much like the Citrix access you’re probably familiar with but for both internal and cloud applications. I was already familiar with the Centrix solution after seeing one of the company founders, Lisa Hammond, give a very good presentation at the recent July 2012 London VMUG. The idea of a converged portal presenting SSO access to all your apps, wherever they reside, is compelling and Centrix has been doing this for quite a while prior to VMware’s entry into the market. How is this relevant to me as a virtualisation admin? VMware’s acquisition of TriCipher lets us integrate identity-based security and managed access to applications hosted in the cloud or on-premise. Convenient end-user access to applications on any device with security controls for IT lets customers extend their security and control into public cloud environments. Earlier this year VMware published a research article on identity, access control, and Horizon which is a great introduction to Horizon and where it fits in the larger ecosystem. VMware would like you to implement Horizon to act as a centralised portal for all your applications whether they reside internally or externally via clouds. Another way to think of it is an ‘app store’ for the enterprise. Michael Letschin (@mletschin) has written a very clear roadmap for the encompassing Project Horizon vision which as a bonus also makes clear where Project Octopus fits in – a great read. For a practical understanding of federation and VDI check out Andre Leibovici’s great article discussing federation in relation to VMware’s View product although he advises that it’s still very much a work in progress. The principles and terminology of federation (IdP, SP, tokens, relying parties, claim rules etc) are largely the same across all the products listed above so I’m glad that by learning ADFS I’ve actually learnt quite a bit about how Horizon works under the hood. The bottomline is that if you’re going to use cloud services and you want to avoid a security management nightmare you need to understand federated identity. if you don’t understand your options early on you may find yourself putting in a solution which solves your short term requirements but not your long term goals, and that could lead to implementing multiple solutions – messy!! 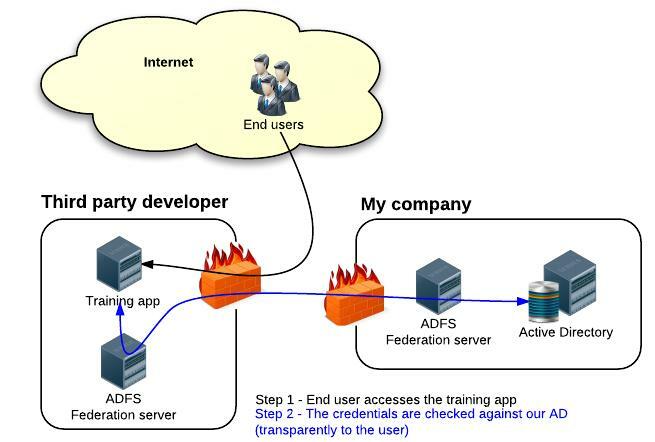 This article barely touches the surface of a very complex subject – ADFS is fine if you’re using Microsoft as your on premises identity provider, but what if you use another user directory from Oracle or IBM? What about two factor authentication? What if a third party uses open source Shibboleth and you use ADFS – do they work together? Can you chain authentication systems together and introduce conditional processing? What about multi-tenant clouds and the special challenges they present? Federated authentication is one small part of a wider subject commonly referred to as Identity Management (IDM). I did enough to get our implementation working but it was immediately obvious that it’s a specialised skillset every bit as complex as virtualisation with multiple products, protocols, compatibilities, design choices and pitfalls. I also found it fascinating to see how the various disconnected services are beginning to be ‘hooked’ up to each other using these distributed mechanisms – there’s a long way to go but this is a growth area no doubt. Will OpenID transform the enterprise ecosystem?